It is difficult to talk about war. And yet many humans do. But how we do it and for how long is another question. Especially with relationships to information today, and relationships to time, I am thinking of fragments. Thinking of spliced conceptions. Thinking of history and those who came before, dealt with war before, and our relationship to those people, to how they interpret and process, and what we owe them. Those people, those we know closest. Family, friends, our allies, or our enemies. But different eras have different meanings. So is there coherence? What provides the link between what was spoken then, lived then, and what is spoken now, lived now? War within the world, but also war within worlds. War within language. The transcendence through language, but the overlap of meaning. Mutations and morphing utility of language, and its evocation and condemnation and control of identity. Whose identity? Whose existence? Whose soul, individual and collective? The tracings of the individual through artefact or ephemera. The ability to parse and discover through historical object, through stable or unstable essence of history and memory. The process of learning, and loving and exploring through memories. The tricky wonder of art, and of words. Don Mee Choi’s Hardly War is a book about all of these themes and problems in existing within humanity. It’s a book of process as much as it is a book of witness. As intent on uprooting a beauty of family and love as it is allowing the space for risking an approach toward the chilling effects of our brutal world, the book serves as an undertaking, as an exploration most humans cannot fathom, do not allow themselves the chance to take. A preface: there is much within Hardly War deserving more than a third party (such as a review) can provide, and so ultimately the book requires a reference on itself. But I will try my best to indicate my own response to the work. On, and slightly below its surface, the effect of the book as it approaches war and international conflict, pre- to post-World War II, pre- and post-Korean War, pre- and post-Vietnam (American) War, is massive. Readers of the text will encounter the enduring spectrum of a powerful poet’s stark and thorough processing of a language seen rapidly transformed across the bounds and barriers and limitations of singular societies. Don Mee Choi’s poetry expresses a belief of language as a root of identity, as a starting point to furthering understanding of a sprawling body of citizens, individuals, those who can be loved, and those who can be torn apart by conflict. Choi’s ability to represent a mature and functional response to seemingly endless, boundless, and quite-ethereal descriptions of tragedy reflects the toolkit of the 21st century: not simply a distance from the event and acts of atrocity in the face of distorted progress, but too the introspection and extrospection fulfilled by a world where “war” is a fluid and often-monumental concept in a landscape lacking the visage to see structures of memory. In this world, humanity is in need of a poetic vision and capable language like that Choi has cultivated. Describing Choi’s surreal fortitude, structured through dreams, philosophy, and memory either personal or otherwise, requires the entire reading process. Challenges of identity through war, as the thematic access point, is an enthralling chasm containing the addled and the resolute. Choi anchors an imagery of suffering with the gasps and hollows of death: and yet there is enough life and growth through the persistence of memory via a father’s photographs, to serve as Choi’s truer anchors of poetic context and optimistic outlook. Whether the poet agrees or not, the production of poems and the representation of peoples in Hardly War reveals a book optimistic, uplifting, bettering our understanding of how to manage trauma and self. Within the book itself we have a landscape of activity, a range of artful engagement. The photographs from Choi’s father, embedded throughout the book and occasionally matched with specific poems from Choi, speak for themselves. Their power is contained within their collectivity. They exhibit a sense of awe both as memorial but also personal fragments of the poet’s intimate family history. The pages of text, divided into the sections “Hardly War,” “Purely Illustrative,” and “Hardly Opera,” are spliced from these printed mementos. The pictures that say the world existed in this way: that there is history and, in a world of the 2000s where both comprehensions of awe and exhibition of certainty is eroded through torrent and onslaught of information overload, there is a sense of wholeness that what survives (from many decades ago) does so in these images. These images come from within and beyond the camera: travels of a man who was lost in the tides and murky pools of conflict. Choi provides the grossly war-mongering and domineering photographs used colonial political campaigns, juxtaposed with personal illustrations for paper doll figures. Further juxtaposition with language representative of intimate transformations of Choi, of Korea, of the World. The textual forms within Hardly War range from the notes of a diarist to verse (both that of the poem and that of the song) to found text to drama. A collage of thoughts and experiences, documenting tracks, delving forward through loss to recover, to regain, to establish fortifications and a space to regrow: Choi’s work serves less as vignette series and more as waking life, dreams within dreams within dreams. Associations bound to the photographs of a father in constant transition from war, a national identity mutated and translated and through structures of power, displacement, and replacement, the hauntingly beautiful recognition of the self that results. Choi’s process of dealing with personal and global words and ideas are extraordinarily relevant in the 2016. Of particular note is the trauma that such tragedy brings, and asking how do humans manage trauma, both in the present and lifetimes beyond? How does meaning change from the moment of the first experience to the diluted or preserved rendition many years later? And in that meaning, where does the individual exist, where does culture exist, where does society exist? Choi’s Hardly War provides a strong method or practice appropriate to current engagements and thinking styles. Not without art, not without some kind of representation that ties the ideas together, can we handle and process our understanding, our statements of identity and healing. Make things radically personal: find the mindfulness and reflection by taking that which is personal and bringing the entire world inward. And conduits—such as a father’s set of photographs—could hold the key to the meaning within. 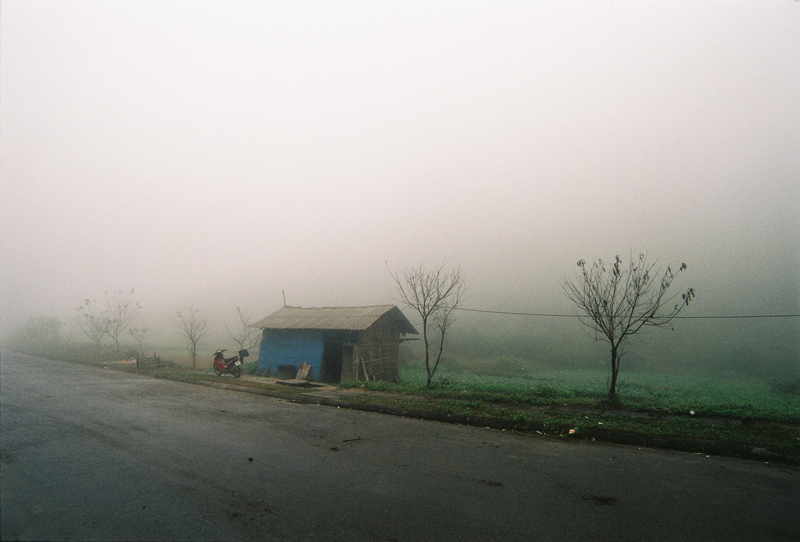 Photographs by Khánh Hmoong and Luca Setti. The writing brings you in close, allows you to relearn the concept of gasping, guffawing, choking on one’s tongue. It’s almost as real as you could imagine it, happening around the corner, down the street. Ocean Vuong’s Whiting Award-winning collection Night Sky with Exit Wounds is indeed an event, a collection that stays with the reader and insists upon its own importance without a shred of entitlement.